It’s county fair week in my pastoral community. When you live in the country, you step through a rift in time. Whatever life you once lived vanishes in a flash, and you wake Ã la Rip Van Winkle in unfamiliar environs. But in the reverse of old Rip, you half expect to turn around and see Andy and Opie in black and white out back by the old fishin’ hole. You know, what I’m talkin’ ’bout. Around here, 4-H rules, Flicka still rides, and Edna Mae Krebs continues to be the source of a lot of ground-down teeth amongst the womenfolk. It’s fair week! Around here, local businessowners throw in the towel because, heck, no one shows up for work. It’s fair week! And the schools? Forget about it. Little Jess and little June are too busy making sure their stew rabbit plumps up nicely for the judges. The principal’s got a bull he just sold at the cattle auction. School? Hey, it’s fair week! Who’s going to be Tobacco Queen this year? When you live in the country, the local newspapers ain’t like nothin’ you read in the big city. The op-ed pages resemble a seminary debate, as the pastor of the Holiness Church takes umbrage with the editorial written by the Methodist pastor the week before, the darned liberal. And the pastor of the Pentecostal church complains that people today aren’t like they were when he was growing up. Back then, people had no problems with a Tuesday night service, a Wednesday night service, AND a Thursday night service. Now you can only pack ’em in on Sunday mornings, Sunday nights, and Wednesday nights. The world’s goin’ to hell in a handbasket. And, of course, the general store is running a sale on handbaskets through the end of the month. Probably won’t be any elders’ meetings at the churches because it’s time to get the crop in. When you’re a farmer, the pastor’s just gotta understand that nothing stands in the way of the crop. God knows. That cloud of dust? It’s the combines harvesting the soybeans. If you look carefully, the corn farmers wear a crooked smirk because they timed their rotation right this year and made a killing. Too bad for the soy guys. Too darned bad. Out here in the country, you ponder daily the fate of your mailbox, but when that’s about the only thing you’ve got to worry about, life’s not too bad. Your neighbor invites you over to hang out on the back porch, and the old farmer’s wife across the way brings one of those orange cakes slathered in homemade whipped butter frosting with the little bits of pineapple and mandarin oranges in it. A cake good enough to set Edna Mae Krebs’s teeth on edge, I’ll tell you. You cool your heels on that back porch and listen to the debates about whether Silver Queen is still king, or whether White Magic, Fantasia, or Silverado has got it goin’ on now. And if you’re the city-slicker—like me—you pay extra special attention because you know this is a life or death sort of discussion that might determine your ultimate eternal destination. Even if it is about corn. It’s fair week. And the Lord Himself is smiling down on us all. Sunday afternoon I listened to my neighbor tell me that the Silver Queen of today just wasn’t the same as it was back in the day. Back then it was just as sweet as can be. That I knew what I she was talking about gives me pause. And not in a bad way: Like Eustace shedding his scaly skin, I feel like a new man when I stop long enough to think about it. I need to stop more. I know next to nothing about corn, but I saw a graph one day that showed that Silver Queen isn’t anywhere near the top of the heap in sweetness anymore. Some newer hybrids beat it easily. Knew a feller who had big mailbox problems—he fabricated one out of 3/8 ” steel sheet. Figures the first teenage punk who takes a swing is like to have a dinger all day long, who knows maybe it’ll even put the fear of God in him. That was one amusin’ post, city-slicker. Put in a mailbox like that around here and you might wind up in jail! We were talking about that on the back porch the other day. Seems Ohio doesn’t want people building vandalism-proof mailboxes, especially if you’re sinking your mailbox into a brick or concrete housing. If someone should wreck their car into one of those and get hurt, you’d be in a heap o’ trouble. You forgot the ritual of morning coffee. In my father-in-law’s farm community hometown, things stop at 9 am, and all the men head to the deli for morning coffee (black, no sugar or cream), where everything of note is thouroughly discussed. I like the slower pace of life there. I wish my husband’s career had allowed us to move there. A recent study on the amount of time the average person spends in various activities during the day included 45 minutes of “socializing” but more than 2.5 hours watching TV. So if having a Starbucks on every corner means we talk to each other more than we watch the tube, I’m all for it. We all need more time talking over a cuppa. Maybe we Christians need to all rethink what our careers are. A friend of mine is worship minister of a church in MN. He got to feeling that he wasn’t socializing enough, so he got a job as a barista at Starbucks, just to be able to talk to people. He’s happy now. I go back and forth trying to decide which lifestyle I enjoy more: urban or rural. I grew up in Seattle, but also spent many years living in Montana, and now I live in a small diary town in Northern Washington. Now I have the best of both worlds (a Starbucks just opened on the edge of town near the Safeway, so it doesn’t affect the quaintness of mainstreet). I used to miss the shopping in the city, but I’ve kind of been detoxing from consumer culture, so that’s no longer a problem. If I could only get foreign and independent movie rentals, life would be perfect! Try Netflix for hard-to-find movies. Dan – What about the ‘social’ sections in the small town paper? This past summer we spent a week with friends in rural Wisconsin (100 acres near Gays Mills) and later went to a family reunion in Rushville IL. In both places, we laughed our heads off at the ‘news’ of the Smiths having the Jones over for dinner and Mrs. Jackson’s aunt from NYC being in for a visit this week. If any city folk (like me) get the chance to pick up a real small town paper, do so. It’s a riot. I once dated a girl who lived in a town of 200 people. Their local paper was a hoot. I spoofed the social section of that paper after a memorable date we had. Those are all varieties of sweet corn. Dan, you are writing about Where We Live! Our small Wisconsin town has just about doubled in size (2,600 now) in the past 40 years, but some things just don’t change. We have a small free “shopper” paper called the Lakeshore Weekly that is really just ads and community info, etc. People who move into town dismiss it as junk mail…but they shouldn’t. It is a real window into the culture here. Read the “thank-you’s” to find out who just had surgery or who died, read the classified’s for everything from garage sales to church events to political opinions. The paper contains congratulations for birthdays, anniversaries and the local winners of sports events. Years ago, a friend called it the “Weekly Religious Periodical” because people here read it religiously. People who move away actually pay to subscribe to it. I lived in Wisconsin, too, in three very different towns: Williams Bay (on Lake Geneva, 30 miles west of Kenosha), East Troy (30 miles west of Racine), and Three Lakes (20 miles NE of Rhinelander). 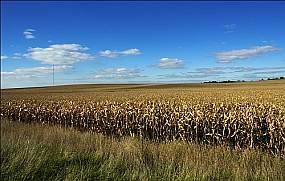 My friend in Gays Mills (12 miles from the Mississippi and 60 miles from IL) calls WI “The Promissed Land.” It’s beautiful where he is. Oh my, you described my hometown! I’m a 10 year member of 4-H, too!